In March 2003, when I moved the website to a new server, I made a few changes to the site. One obvious one was the change to the image in the banner. The old image was done by my dear friend Kat Rasmussen. We were friends in high school, but lost touch after graduation. She found me again on the web in 1997. She was starting a career in web design, and she actually begged me to let her redesign the site. In '98 I finally caved. 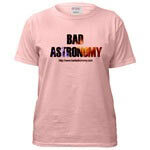 I had just bought the domain name badastronomy.com, and wanted to punch up the website when the new name went live. She coyly asked me what images I thought represented Bad Astronomy best, but wouldn't clue me in to what she meant. I gave her some ideas, and of course she took none of them. What she did do was come up with a pretty cool image that became my banner image, and remained so for five years. The image is of Ganymede, Jupiter's largest moon. The letters in "Bad Astronomy" are reverse-masked, so you see the moon through them. I thought it was pretty cool. I still do. In 1999, I wanted to get business cards, and wanted a more colorful image for them. My friend DeLee Smith, who is a graphic artist, put a great image together; it's now the one I use at the top of every page of this site. It has the same idea as the old image, with the letters reverse-masked over an astronomical image. This time, though the image is of NGC 3603, a gorgeous nebula (cloud of gas and dust) as seen through the eye of Hubble. It may be, in fact, my favorite image from Hubble. And, as it happens, I have a little history with this object. In the image seen here (click on it to see a bigger version), there is a star in the upper left that has a broken bluish ring around it. Just to the upper right of it is a saucer-shaped blue cap, and the same to the lower left. The bright star in the ring is named Sher 25 (it's the star in the letter "A" in "Astronomy" in my new logo). It's a pretty interesting star. Classified as a B1a, it's a hot supergiant, tipping the cosmic scale at something like 40 times the mass of the Sun. Stars like that don't live long; a few million years tops. When they die, they do it with a bang. Literally. In a few thousand years, and no more than 20,000, it will explode. When it does, it will send out a flood of high-energy ultraviolet photons that will slam into that ring of gas, making it fluoresce like a neon sign. How do I know this? The star is a virtual twin of the star that blew up to form Supernova 1987A. In fact, there are many similarities. Long before it exploded, the progenitor of SN87A formed a three-ring system around it (see the picture to the right). These rings are made of a very tenuous gas, and they have a complicated but interesting history. No one knew of the rings before SN87A exploded because the star wasn't quite hot enough to excite the gas; it took the fury of the star exploding to light up the ring system. From studying the rings, their age can be found, and it's pretty well determined that they formed about 20,000 years ago. Since the star blew up in 1987, and the rings formed when Sanduleak -69 202 was a star like Sher 25, it's reasonable to assume that Sher 25 has a maximum lifespan of 20,000 years. In fact, Sher 25 may have considerably less time. We don't know how long it's been a blue supergiant; it may have turned a thousand years ago, or 18,000. It may actually be right at the end of its life, and may explode like its twin did any day now. I am frequently asked what star I think will blow up next, and many astronomers assume it will be Betelgeuse, the red supergiant located in Orion. But I wonder... not too many people have heard of Sher 25, but I bet they will soon! One last note: the other reason I am fond of this star is that it was the subject of the only paper I ever refereed as a professional astronomer. I was delighted to referee the article; it was excellent, and was the first time I had ever heard of the star. The authors even thanked me in their acknowledgements: "We thank an anonymous referee for valuable comments." Sniff! How touching! ©2008 Phil Plait. All Rights Reserved. Check out my book "Bad Astronomy"